I have an SD card which I used on my camera. I looked at the photos the night before. When I tried to work with them the next morning (after re-inserting the SD card back into my computer) the card had become inaccessible. 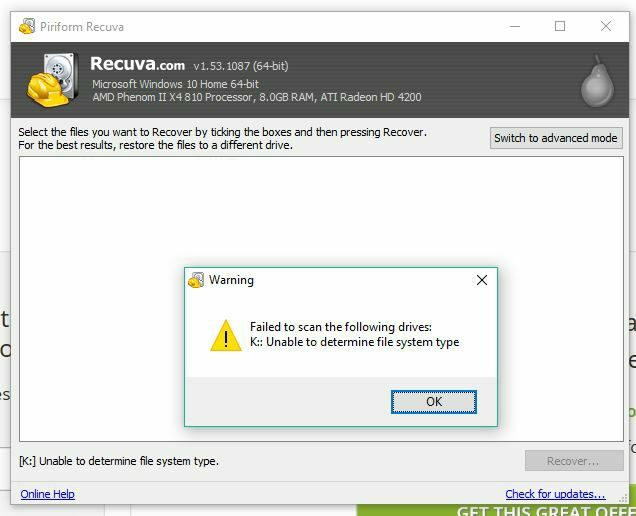 Tried working with Recuva but I can't get past "Failed to scan the following drives: K:: Unable to determine file system"
Neither my regular desktop or laptop or the camera can now access it. Is there any hope of recovering some very important photos with Recuva? Hi mike, and welcome to the forum. The most used and easiest option is to carry out a "Quick Format" to the card, and I stress "Quick" as opposed to a "Full Format". 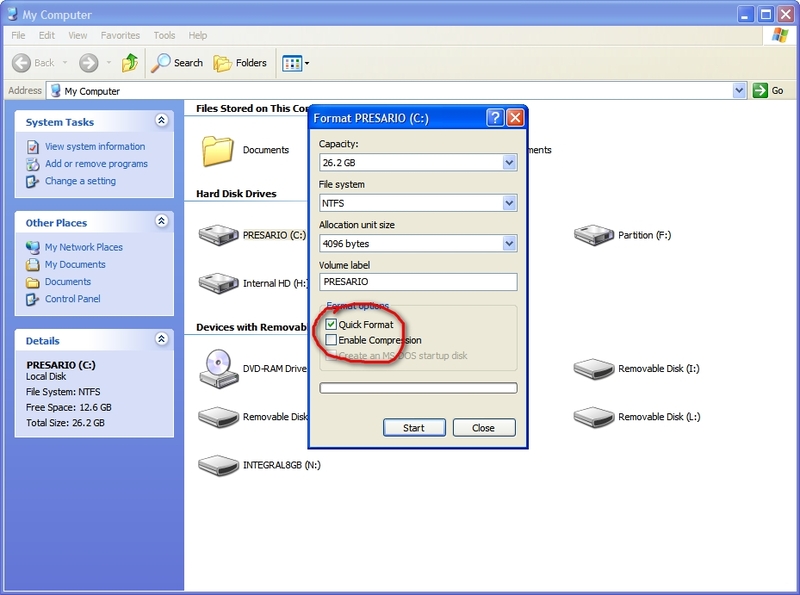 This will initialize the file system making the card visible and accessible again. Although this quick format will make the card appear to be empty, all your files will still be there. The quick format simply re-writes the boot sectors which tells Windows that all the space on the card is available to be written to, without actually overwriting any files. And before you scan with Recuva go into "Options/Actions" and select "Scan for non deleted files". This depends of course on a corrupt boot sector being the only problem and not some sort of other damage to the card or the data on it. One of the other options is to attempt to repair the boot sectors using free software. This is more daunting that a simple quick format. The important point here is ... if you do carry out a quick format, then you will overwrite the small backup copy of the current boot sector which windows created when the card was last formatted. There is free software which can compare the boot sector and it's copy and use the copy to rewrite the boot sector data. In theory restoring your card to it's original state. And again, this depends on a corrupt boot sector being the only problem and not some sort of other damage to the card or the data on it. So, let me know if you're happy to go down the easier road of a quick format, or if you want to get involved in the more complex process of trying to repair the boot sector. Although you would have to do this yourself, I'll link you to the freeware needed, and guide you as best I can. I am getting the same error "Unable to determine file system type" while trying to recover data from a laptop hard drive that is non-responsive by conventional means. I have the drive hooked up to another laptop via usb to do the recovery. Is it possible to do the same quick scan that you mentioned in your previous response? If so can you walk me through it? Hi Zakk, and welcome to the forum. It seems that the drive actually has a drive letter which means you could carry out a "Quick Format", not a Quick Scan as you say. You don't mention your Operating System otherwise I could probably have found you a pic of the relevant dialogue box on your system. It might be different in some way to XP. If you're not in any kind of a hurry, before you go down the quick format route maybe give me some more information and there may be other options to try first which don't require any writing to your drive. What happened to the problem drive to cause the issue in the first place, and is it a "System Drive", ie containing an Operating System, or is it a data drive simply containing personal stuff like photos, music etc.? I'm assuming from the error message you mention that it does have a drive letter, so could you tell me or show me with a screen shot how it appears in "Disk management"? And if you're not sure how to do that, let me know your Operating System and I'll be able to show you. Your choice of course, you can do a quick format and see what Recuva can find or you could try other options first. And I repeat, the other options do not initially require the drive to be written to in any way. The hard drive in question is one I have removed from a laptop because it stopped co-operating. I couldn't get past the screen that was attempting to fix disk errors. it would linger there for days. It does have an operating system on it. it's running Windows 8. I just want to get my Data off of it before I send it off to be replaced under warranty. I put it into a holder of sorts that has a USB cable so I can connect it to my other computer. When I right click on the drive in windows I do have the option of Format amongst others. When I click Format a box pops up with a few options and quick format is already checked. Unfortunately I'm not sure how to paste a screenshot into this forum but it looks very similar to the screenshot you posted. Should I continue with the quick format? I can't tell you definitively what you should do for the best outcome, but with your situation of not being able to get past the chkdsk you appeared to be attempting I think trying a quick format may be your only option. Whether it was a software or hardware issue preventing the checking of the drive is impossible for me to even guess. So the simplest option would be the quick format. This would not touch any of the data on the drive but be aware that there are no guarantees in file recovery, no magic bullet sadly. Remember to go into Recuva's "Options/Actions" setting and check the "Scan for non deleted files" box. Would also be worth going into "Options/General" and set the View Mode to "Tree View". This will display any found files in their original folder structure. Much easier to drill down and choose the files you want to recover. Also in "Options/Actions" check the "Restore Folder Structure" box and any recovered files will be saved in their original folder structure albeit a copy of that folder structure on a different drive. Saves a lot of organising. Any problems let me know and good luck with it.